Learn how to create data connectors. Upload via an FTP source file on a daily basis. Data is consolidated by the customer in a single CSV file and uploaded. Upload via the private PlayVox API. A connector for the PlayVox private API is already available on your platform. You will select it in the next Step 3 document when creating KPIs. Step 3 Creating KPIs - Learn how to create KPIs and data formulas used in campaigns. For the FTP option, you will need to set up an integration (Connector) to upload agent performance data as a CSV file to an FTP site. This document explains how to create a Connector. KPI data, or variables that make up a KPI, are consolidated into a single CSV file and uploaded manually or automatically, typically on a daily basis. Data may already exist in a spreadsheet, consolidated in a data warehouse facility, or pulled together as exports from one or more sources. This uploaded data will be associated to performance campaigns and user dashboards. More on data files later. 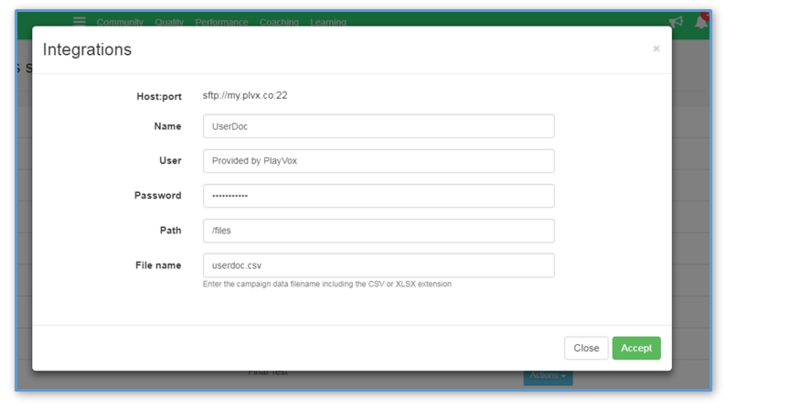 PlayVox provides a secure FTP site for data file uploads. You will create an FTP Connector between PlayVox and your secure FTP site. 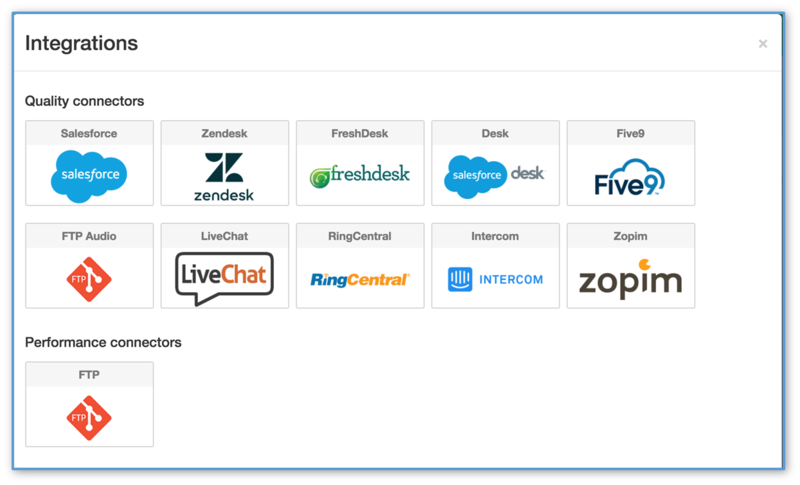 Note: Vendor specific API connectors on our website to third party platforms such as Zendesk, TalkDesk, LiveChat, etc., are only to access customer interactions for quality evaluations. The integration connectors do not access performance data from those platforms for use in Performance campaigns. The FTP connector is used in these cases. An FTP Connector will be created for each file that you use as a data source. You can use one file for multiple campaigns. Go to the platform administrator gear in the upper right hand corner of the screen. Select Integrations. From the Integrations settings screen, click on the green '+' button on the upper right corner. Select the FTP icon for Performance connectors. This is the only option for Performance Campaigns. Fill out the following information. Host and Port are automatically assigned. PlayVox will provide you with User and Password prior to you beginning this process. You provide a Name of your choice for this connector, the path to retrieve the file found in the FTP client, and file name. Path is not required but typically customers create a files directory (/files) to hold data files. Press Accept. We will confirm the Connector is built, and it will be added to your list of existing Connectors for future use. Step 3 Creating KPIs - Learn how to create KPIs and data formulas used in campaigns.